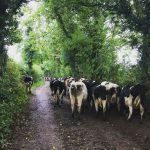 Quiz – An Ideal Farm Husband? Quiz – Perfect Farm Wife? I’m tired. It’s not often that I’m really tired. 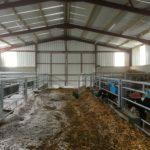 It has been a busy couple of months: new calf shed being built, 130 calves born, and lots of finishing touches to Till the Cows Come Home which is being published in May. But it’s the relentlessly bad weather and all the extra work that goes with it that has made me tired. We knew the weather wouldn’t be great over Easter but the fact that it is continuing on for another few days seems to have sapped our energies completely. Many farmers are saying this is the worst spring for decades. 2013 was bad for many: heavy snow in Wales and Northern Ireland but although it was very cold here and there wasn’t much grass growth, it was fairly dry so our livestock were able to go out. 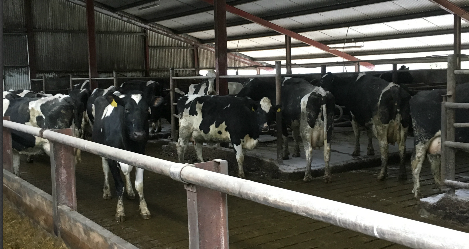 Winter 2017 came early and as it was very wet, cows went indoors earlier than normal whereas the previous year, they were out by day until early December. We have quite heavy land so getting cows out by St Patrick’s Day is usually good going for us and it’s certainly a bonus if they are out at grass by March 1st. Not a blade of grass has been eaten yet and it will be at least the end of the week before any go out, judging by the forecast. Although all the silage made in 2017 is gone, and they are eating reserves, that is what the reserves are there for. The farmers really struggling with the long winter are those short of fodder. 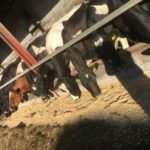 Those with dry land would have typically let cows out to grass as they start calving from the end of January and wouldn’t usually require as much silage as others. Their land is ‘sticky’ and as it is so cold, the grass just isn’t growing as it normally would. 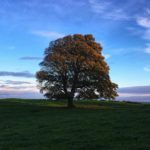 Some farmers have expanded numbers and may have been relying on an early spring which just hasn’t materialised. At best, farmers are browned off and at worst, they are under severe pressure – financially, mentally and physically. Yet, despite this bad weather, and the fact that we feel we’ve been tied to yard work for months, and a change of scene such as the job of grass measuring or even fencing would bring some welcome variety to farm life, and yes, we are both tired and fed up but it’s tedious rather than a huge low in farming for us. We are severely browned off and we’re tired but the lows in farming for me aren’t necessarily weather-related or even financially-related. The lows are when a death occurs. One of our cows died last week. It looked like she had an internal haemorrhage and the vet confirmed it. He wasn’t overly hopeful but felt that if she survived till the next day, she would have a good chance. The weather was horrible, the wind whipping by us as he treated her in the cattle crush. Then she went down in the crush and she wouldn’t get back up. There weren’t many options – build a wall of straw bales around her to protect her from the wind and hope she got up. The vet said if she hadn’t got up in a few hours, to let him know and he’d come out to put her down. We couldn’t leave her there for too long. She did get up within the hour and was led back to the straw bedded shed where she’d have some comfort on her own. She was still alive the next morning, chewing her cud, but not eating much. We weren’t overly hopeful but as the saying goes “where there’s life, there’s hope”. She lived till the next morning. Brian was with her when she died and she went peacefully. She wasn’t in pain, she was lying there and her breathing changed and then her heart just stopped. It’s never nice when an animal dies but the silver lining was that she had a peaceful death and it really was just one of those things: a haemorrhage from an ulcer. There was nothing that could be done, we couldn’t say “if only we had done that”. It was just one of those things. It was ‘a low’ but one we put behind us. We’ve had a mini surge in calf births the last few days. Number 1885, one of Kate’s favourite cows as she is always last in the line and enjoys a head rub, had a heifer calf. There was lots going on in the yard between the vet being there and a meal lorry delivering dairy nuts so I wasn’t rushing to bring 1885 over to the parlour to be milked. Even though she was born about half an hour, the calf wasn’t up yet which was a bit unusual but she was sitting up and I reckoned she’d be fine for another while until things quietened down. 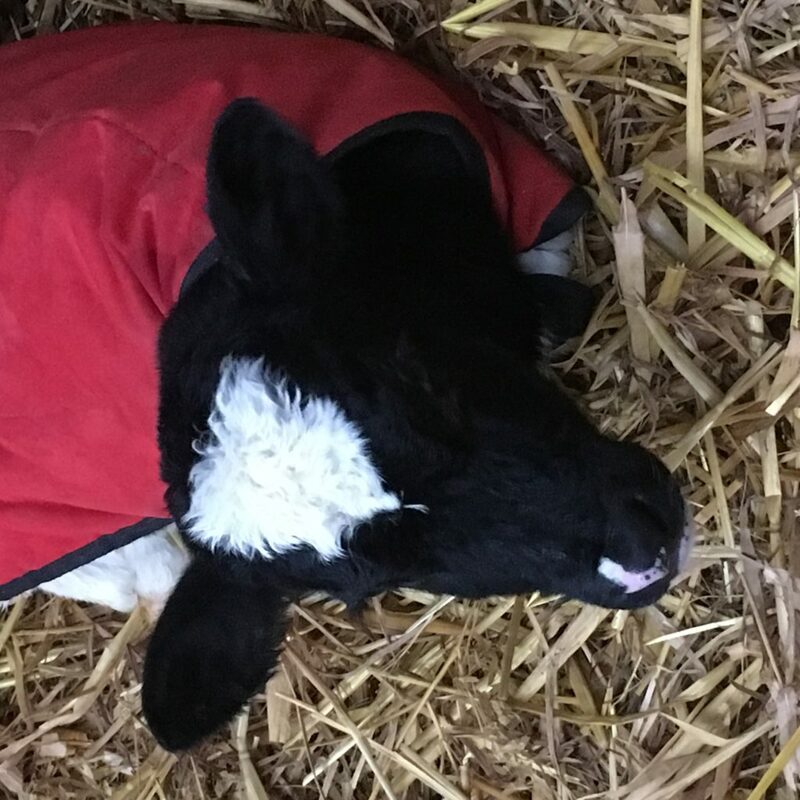 I had to go indoors to get something and passing by the calving monitor, I noticed that the calf was lying outstretched on the straw with 1885 licking it. I ran out, wondering if the dam had lain on it, it looked that outstretched and flattened. She hadn’t been, thank goodness, and I checked her navel first in case that was bleeding and the blood loss had caused her to become weak. It wasn’t bleeding but she seemed very weak. There was a litre and a half of colostrum left from a freshly calved cow that morning so I ran to get her a calf coat and to warm the milk. 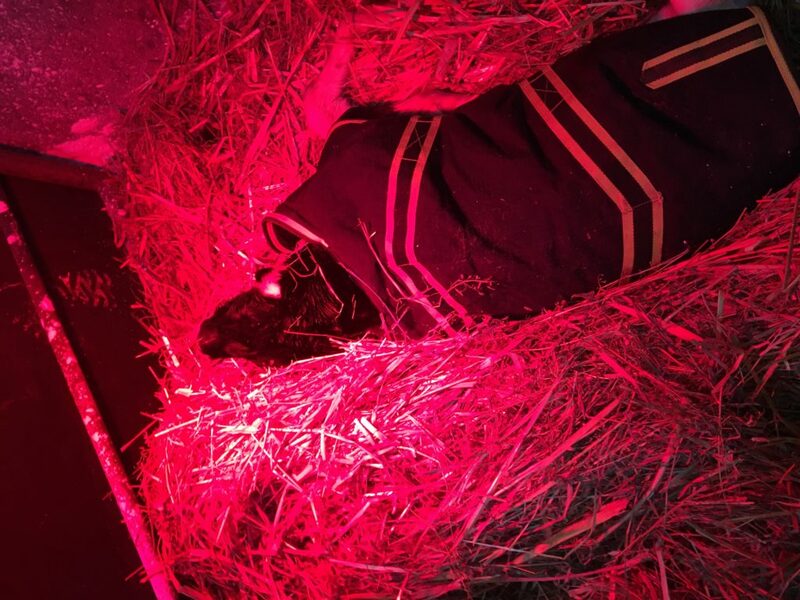 She sucked the milk from the bottle which was a good sign before moving her to a calf pen with a heat lamp. Once her mother was milked, she took another litre. She hadn’t moved much by the next morning. I changed her coat as it was soaked with urine and she fed well, standing up as the bottle was nearly empty and looking much brighter. By the following day, she was fine. Definitely one of the highs of farming. When I thought about it, I realised that most of the things that make me happy in farming happen on a daily basis. Yes, I’m sick to death of scraping and liming cubicles and it would be lovely to be getting cows out to grass, but to see calves greet me every morning with a cacophony of bawls as they skip to the feeders in perfect health definitely provides me with a daily high. As they say, health is wealth. We’re totally browned off with the rainfall again today, wondering when on earth will cows get out but surely, sometime soon, those clouds will be empty and the sun will be shining. Having said all that, if the milk processors attempt to pull price this month, I’d imagine there will be an ‘off with their heads’ kind of revolution from farmers. I think most have reached the ‘end of their tether’. What about you? What are the highs and lows in farming for you? How are you managing with the current bad weather? Cool! calf birth a few days ago. It always fees good. 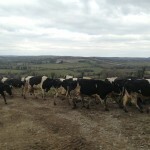 I have started my blog on agriculture and livestock. I also share my experience on beef cattle farming. Hope you will like that. Highs and lows of arable farming: we’re sIck of the incessant rain here in southern England too! On Good Friday it rained without stopping from the moment we got up until we went to bed. Perhaps not so unusual in Ireland, or even in Cheshire where I’m from, but definitely not usual in Dorset! Poor husband hasn’t got any of his spring crops (barley, oats and beans) in the ground and he should have finished by now. But there are highs too. The birds have started singing their hearts out in the mornings, the partridges are paired up and the lapwings are doing their courting displays. When the weather does dry up, the hares will be boxing in the sunshine. Surely that day will come soon. Thanks for reminding me to look out for the highs of farming from under my rainhat! Hi Kate, I don’t know if it’s good or bad that everyone is in the same boat re the bad weather. I know that whenever it does take up,there’s a huge amount of field work to be done on every farm. Yes, it is the animal deaths that get to me. Not the older ones where it’s expected, but the ones where you feel you might’ve done something. Even when the vet would confirm it was not avoidable, we’d feel bad. There is a huge emotional commitment to animal husbandry that is only understood by others on family farms. Weather way below normal highs here too, can’t get animals on pasture, can’t get in the garden…arggghhhhh. Maybe we don’t celebrate the births often enough. Our old vet always said that it was amazing so many calves survive given all the odds. WE seem to lose a cow a year,something happens be it a tumour or a broken leg or pelvis or like this one, a ulcer that bleeds. As long as it’s not in the house – as they say. Yep, sick of the weather. Self-Publishing or Traditional Publishing – Which is Best? Are Cows just Numbers or Do We Name Them? Do Old Cures Really Work?